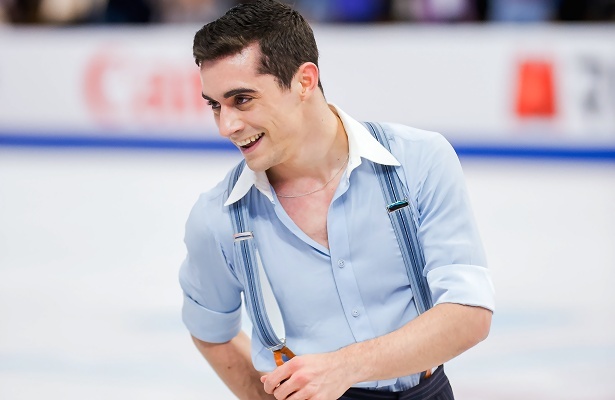 Javier Fernandez of Spain won his second consecutive title at the 2016 World Figure Skating Championships. In a showcase of exceptional men’s skating at the 2016 World Figure Skating Championships, Spain’s Javier Fernandez defended his title by edging out Japan’s record-breaking Yuzuru Hanyu. China’s Boyang Jin claimed the bronze medal, becoming the first Chinese man to step onto the world championship podium. Fernandez performed his expressive “Guys and Dolls” program with flair, drawing the audience into this performance with each successfully landed jump. His technical feats included a quadruple toe loop, quadruple Salchow-triple toe loop combination, another quadruple Salchow and two triple Axels. He scored a personal best of 216.41 in the free skate for a total combined score of 314.93. Making the finish even more impressive was that the Spaniard was suffering an inflammation in his right heel. As a result, Fernandez was unable to practice much on the day of the free skate and felt uncertain approaching the final. Hanyu nearly captivated the crowd with his soulful “Seimei” program. Like the warrior he was portraying, the 2014 Sochi Olympic Champion had to battle a few jumps, particularly the quadruple Salchows. Hanyu’s first attempt on the quad Salchow required a hand down in order to save the landing and the second sent him crashing to the ice. A three turn coming out of his triple Axel and another hand down on the triple Lutz sealed his fate with a score of 184.61, opening the door for Fernandez to roar through. Hanyu’s total combined score was 295.17. Jin skated his animated “Dragon Racing” riddled with difficulty, but had uncharacteristic problems with his jumping passes, including unpolished landings on the quadruple Lutz, Salchow and toe loop. He was able to move up to third place with a free skate score of 181.13 and total combined score of 270.99. Nevertheless, Jin was excited to the first man to medal for China at a world championship event. Mikhail Kolyada of Russia performed cleanly to his “The Nightmare Before Christmas” free skate which was equal parts mysterious and playful. He scored 178.31 for a total score of 267.97. Three-time world champion Patrick Chan struggled during his Chopin routine, tripling his planned opening quadruple toe loop, crashing into the boards on his quadruple toe loop-triple toe loop combination, popping the second planned triple Axel, and doubling a planned triple flip. He scored 171.91 in the free skate, but in fact pulled the second-highest program component scores of the night. He placed fifth with a total combined score of 266.75. “I feel like I have a renewed idea of why I am doing this,” said the 25-year-old, reflecting on his season. “No regrets at all,” he added, steadfast in his Olympic aspirations. American Adam Rippon placed sixth (264.44), Shoma Uno of Japan placed seventh (264.25) and American Max Aaron placed eighth (254.14).